Mason Lynass is a percussionist and composer creating new contemporary classical and popular music, currently based in Seattle, WA. Mason has performed as a soloist and as an ensemble member in venues and concert halls across the country. As a soloist, Mason’s work was most recently featured at the Racer Sessions, Seattle’s John Cage Musicircus, and Chosen Vale Percussion Seminar. Outside of his solo work, Mason has played festivals and toured the west coast with Señor Fin and Baby Jessica, participated in Inuksuit NYC, and performed at the Percussive Arts Society International Convention with the UNT Percussion Ensemble and the Santa Clara Vanguard. In 2017, Mason won the Portland Percussion Group’s Call for Scores with his work Tesserae, composed for percussion trio or quartet. 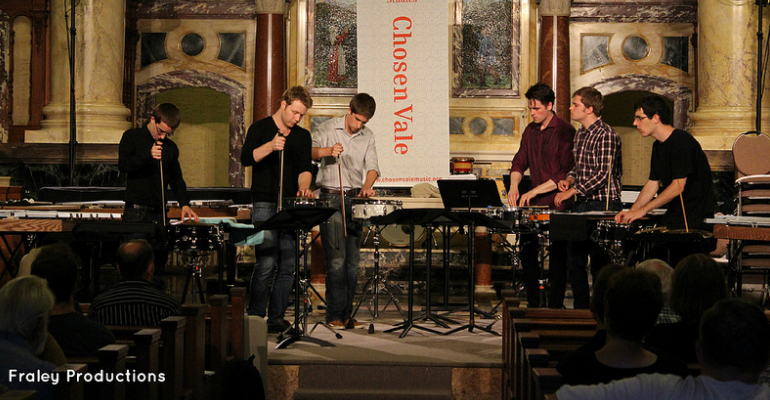 The Portland Percussion Group premiered Tesserae in May of 2017, and the piece will be published on Tapspace in 2019. Mason earned a BM degree in percussion performance from the University of North Texas in 2014, where he studied with Christopher Deane, Paul Rennick, and Ed Soph. During his time at North Texas, Mason performed with the UNT Wind Symphony, Percussion Ensemble, and Concert Orchestra, and enjoyed learning about the percussive repertoire & music cultures around the world. Mason also participated in two national tours with the Santa Clara Vanguard (2012) and the Blue Knights Drum and Bugle Corps (2011). Mason is currently pursuing a Master of Music degree in percussion performance at the University of Washington, to be completed in 2020. At UW, Mason is studying with Dr. Bonnie Whiting, leading chamber groups and working on new solo percussion material.